Pic(k) of the week 7: Is this a robbery? There is however another side of Dubai which can be found around the Creek, an inlet in the shoreline, where life in Dubai all started. The city has been a trading place since a long time and still has a large number of Dhows (wooden boats) which deliver goods to India, Pakistan and across the Gulf to Iran. Lately, I went shooting at the Dhow Wharfage. A buzzing center where Dhows are continuously unloaded and loaded by hard working sub-continent workers pretty much 24hrs around the clock. These dockworkers really want to tell their stories and are not shy to get into the picture. A photography paradise! These two guys opening a truck are obviously not robbing the goods, but are at the beginning of a long working day. Most people know I've been fascinated by flight since a very young age and are aware about my day job as an airline pilot. Even though I'm not a birder, I do regularly come home with Seagull images from all over the world. That was again the case 2 days ago when I went out for a shoot in Dubai and spotted a whole bunch a Seagulls sitting on an unused dock at Dubai Creek. Even though I've never really done anything with my Gull images, I decided to create a new gallery in my Wildlife collection. A bit of a personal project I guess. Feel free to have a look here. It's been relatively windy last week here in Dubai. 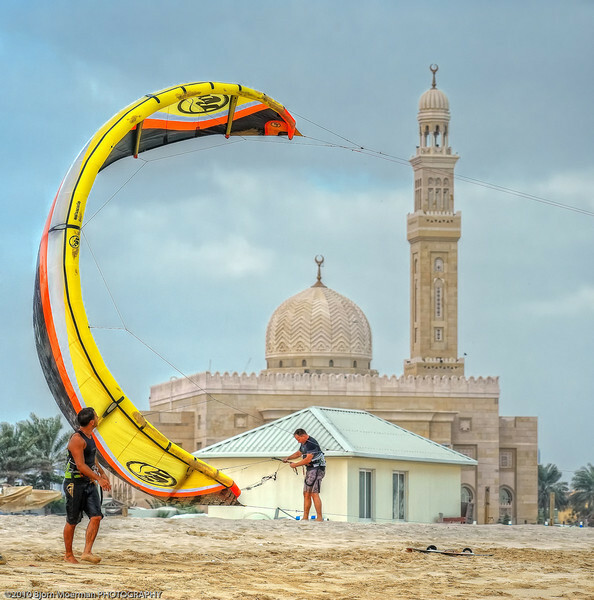 Kite-surfers seem to be having a good time on the Jumeirah beach. The Christians have the cross, the Jews have the star of David, and the Muslims have the crescent moon, right? 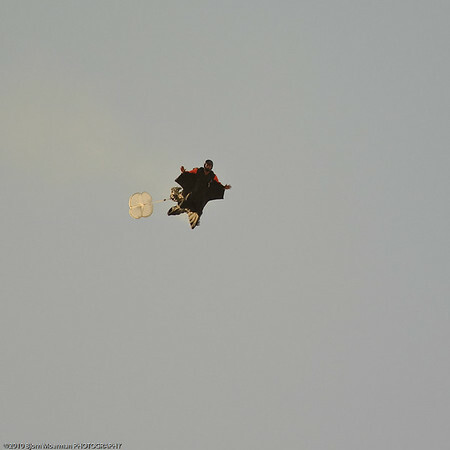 When this kite was about to be launched with the Mosque in the background, I clicked the shutter. Made an HDR out of 1 exposure and then increased contrast with Nik Software ColorEfex Pro. The image was mirrored to have the crescent moon shape as we mostly see it as an symbol of Islam. 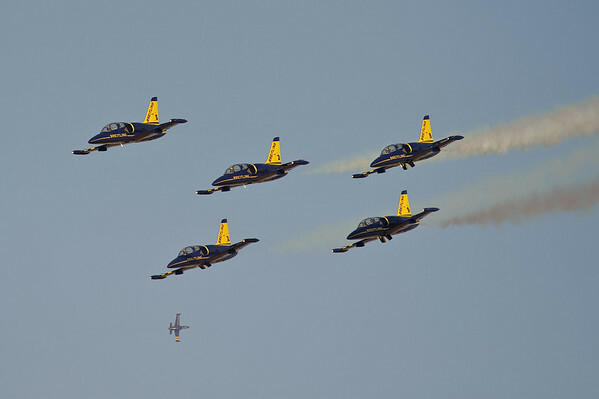 End of January I attended the Al Ain airshow 2010. A yearly event held in January or February since 2004. It is a rather small airshow by international standards, but always worth going if you're in the area. It is hosted at the Al Ain international airport which is just a 1h15' drive from Dubai. The desert city Al Ain is the second largest city in the Abu Dhabi emirate and the fourth largest in the UAE. Just like any airshow, one or two acts stand out. For me it was this years demonstration of the wing suited skydiver who was dropped from 5000ft by a Deltaplane and who opened his chute ( no reserve parachute fitted ) at a very low altitude of maybe 200 to 300 feet. Back in Al Ain, but this time under a new name, were the Goodyear Eagles. 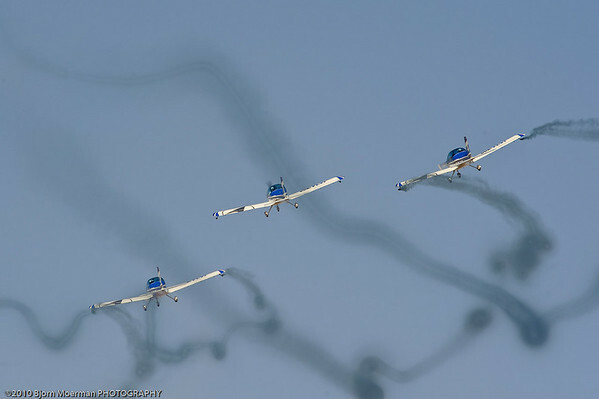 3 South African Pitts Special S2B's who are starting their act by an inverted synchronized skydiving drop followed by an excellent close formation display. 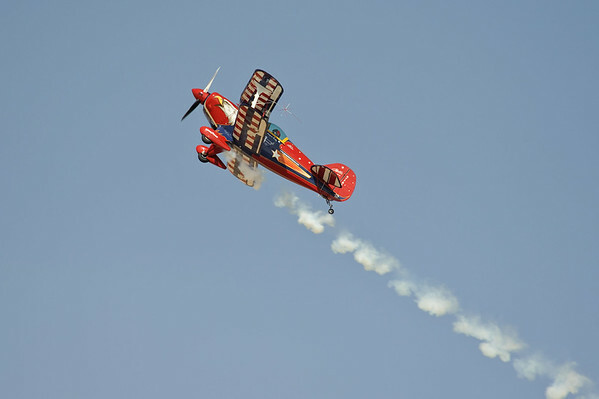 There always is a fair amount of very good aerobatics to be seen at Al Ain. 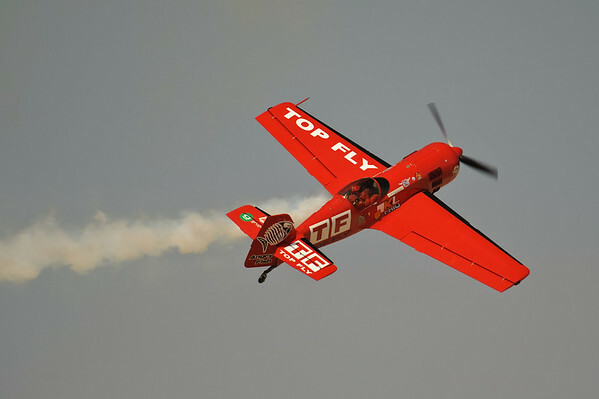 This year the Aero GP were held at the Al Ain airshow. 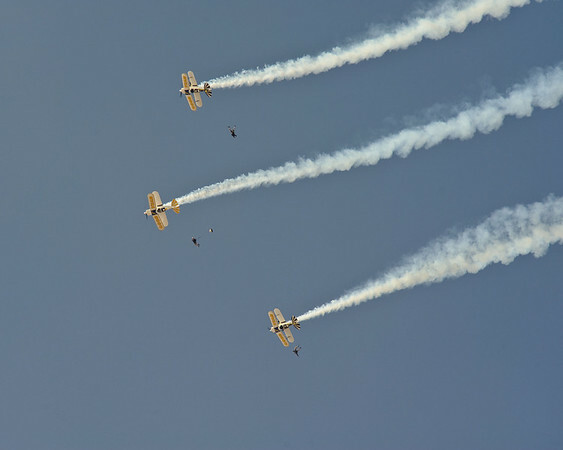 A three discipline championship consisting of an Air Combat mission (chasing each others tail), Air Racing (call it mini- Reno Air races) and an Aerobatic discipline. Even though the Aero GP seems to have a hard time taking off as a sport, spectators really seem to like it. Unfortunately there are only a handful places organizing Aero GP championships! If my memory serves right, the Royal Saudi Air Force, Saudi Hawks have attended the show every year since 2005. They are obviously inspired by the Royal Air Force Red Arrows which fly the same type of aircraft. 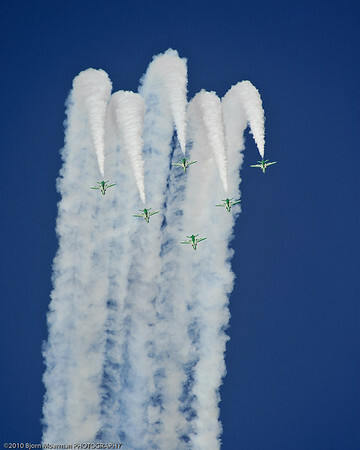 Their formation flying is solid but can't compete with teams like the Red Arrows, Frecce Tricollori, Patrouille de France, Blue Angles, and the Thunderbirds. Nevertheless, still an interesting demonstration. Staying with the jet teams, this was my first opportunity to watch the Breitling Jet Team also known as the Patrouille Breitling. They call themselves the only civilian jet aerobatics team and fly 7 Czech made L39 Albatros twin seater, military jet trainers. The French pilots almost have mostly a fighter pilot background and one or two are ex Patrouille de France team members. Their formation flying is top notch, especially given the fact that they only do 15 training sorties a year. Unlike other large jet teams which normally consist of about 60 to 70 people, they travel as a very small team, 7 pilots and 7 engineers who travel in the backseats. No fancy C130's or Transall as a technical support aircraft. Last but not least, I really appreciated the demo of the 1956 Hawker Hunter called Miss Demeanour. A colorful and noisy UK vintage jet fighter nicely put through its paces and operated by Heritage Aviation from the UK. The beautiful desert background is always unique in the airshow circuit and I will be putting next years date back on my calendar as soon as it becomes available. PS: All images were shot with my D700 fitted with the brand new Nikkor 70-200 2.8 VRII lens and the 1.7 converter. A great combination!